Coconut Grove Restaurant & Lounge opens in downtown Provo. A quote by Colin Powell resonates with me when I think of the new restaurant Coconut Grove in downtown Providenciales, “A dream doesn’t become reality through magic; it takes sweat, determination and hard work.” This was the driving force behind two young entrepreneurs to bring their dreams to existence. Coconut Grove Restaurant & Lounge was established by local entrepreneurs Wellington Williams, 21, and Nosben Clerisier, 27. Both young men are a product of Turks & Caicos, having schooled locally at Clement Howell High School before matriculating to Turks & Caicos Community College. They’ve created an oasis to enjoy local cuisine made the authentic Turks & Caicos way. Young Wellington Williams has made his dream of owning a restaurant come true. At the community college, Wellington Williams excelled in Food & Beverage Services and Hospitality Management whilst Nosben Clerisier shined in Hotel and Tourism Management alongside Building and Design. Subsequently, Wellington progressed to a four star hotel on Grace Bay Beach where he was employed as Guest Service Agent and Personal Concierge. Here he exceeded expectations on the job, walking away with several accolades including being named the TripAdvisor Employee of the Year. Nosben, who is an excellent mixologist, has over 15 years of experience in the restaurant business. 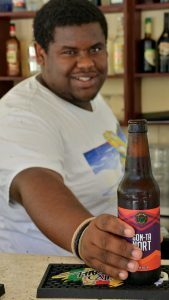 He gained vast knowledge in several establishments across Providenciales, working his way up to Head Bartender at Caicos Café and attaining the position of Assistant General Manager at the popular Coco Bistro restaurant. Of his journey Nosben says, “Success is attainable to any man, you just have to reach for it.” It was a reach made together that birthed Coconut Grove. Coconut Grove is tucked away in a plaza just behind Provo’s bustling downtown. Tucked away in a plaza just behind Providenciales’ bustling downtown, Coconut Grove is a peaceful tropical haven—with the ocean and beach replaced by a crystalline pool and sprawling patio enclosure. The main dining area includes brightly painted picnic benches shaded by lofty coconut palms; leafy lounge areas near the pool offer a more private dining experience. Visiting Coconut Grove for lunch gave me the chance to sample the delectable menu I’d been hearing about through the island grapevine—both by word of mouth and on social media. I wasn’t disappointed. 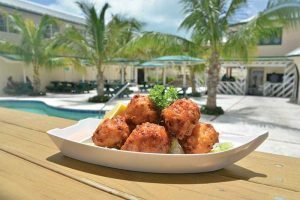 “Conchy” conch fritters, fried to perfection. Sumptuous sweet and sour cracked conch, served with mango salsa and fresh plantain strips. Juicy oxtails, peas ‘n’ rice, and delicious chicken tacos—I tried it all! What was most apparent was the obvious care taken to prepare and serve each dish; everything was imaginatively conceived, well-seasoned, cooked to perfection and beautifully plated. I imagine that both locals and tourists will appreciate the tasty, reasonably priced fare, tranquil atmosphere and friendly, careful service. Oxtails never tasted so good! I came to the restaurant myself, then quickly invited friends for ice-cold beers and a few rounds of dominoes and pool on the breezy entertainment deck upstairs. Replete with flat screens and a live DJ, we ended up having a “super-chilled” day. With Nosben’s refreshing cocktails (the signature rum punch is a secret recipe) and a view of the restaurant from the deck, lunch at Coconut Grove felt like a VIP experience. I can say that this level of dining is something you don’t normally experience outside the waterfront restaurants of Turtle Cove and Grace Bay, and certainly not at the affordable prices available at Coconut Grove. Delicious meals in a relaxing tropical environment downtown—something refreshingly original for Provo is being cooked up at Coconut Grove. Besides being the driving force behind the restaurant, Wellington Williams designs and crafts the most beautiful and original beach sand jewelry. It is for sale at The Wellington Collection store adjacent to the restaurant. 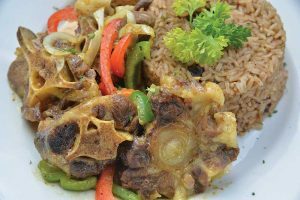 Coupled with the added advantage of its stone’s throw proximity to the Junkanoo Museum and Turk’s Head Brewery tours makes Coconut Grove Restaurant part of a day of “downtown” activities for locals and tourists alike. For more information, call 649 941 7300 or email coconutgrove@yahoo.com or visit Facebook Coconut Grove Restaurant & Lounge for daily lunch specials. What's Inside The Latest Edition? © 2011 - 2018 Times of the Islands. All Rights Reserved.